How will newspapers shift their business center of gravity online the same way most have shifted their audience center of gravity? That is the question keeping every newspaper executive awake at night. But the Web audience is growing at a great clip, while print circulation is not. And online revenues are growing faster, too, albeit from a smaller base. If the trend continues, there’s little doubt that — “eventually” — online becomes the main business. Most newspaper executive use words like “eventually” to push off into a fuzzy future a transition that they know needs to happen sooner rather than later, but still find impossible to conceptualize because of the 10% problem. Let’s assume that the NYTimes.com has roughly the same portion of ad revenue coming from online. What you find, with some modest rounding, is that print circulation is about 10% of total audience reach, while online advertising revenue is 10% of total ad revenue — the economics are nearly the perfect inverse of what they should be. So let’s say I wanted to buy a quarter page ad in the Sunday edition for each of four weekends across a month. A half page is 63 column inches, so four quarter pages would be 126 column inches for the four ads. 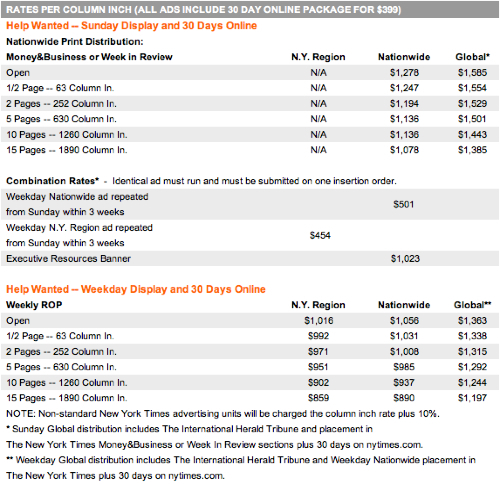 At a half page rate of $1,247 per column inch, that’s $157,122 for the four quarter page display ads in print. Those ads would run in the Money, Business, or Week in Review sections, so would reach people who didn’t necessarily look in the employment section. It’s difficult to compare it then to the $7,500, which gets you a 20% share of voice display ad in the online job market section. But given that the NYTimes.com has nearly 10 times the reach of the Sunday print edition, $157,122 vs. $7,500 is a pretty eye-popping disparity. The homepage of nytimes.com is viewed by more than 1 million unique visitors every day. For Job Market advertisers seeking quick access to an extremely large audience, the Employer of the Day position can deliver a branded message twice per week. This position exists on the homepage of nytimes.com in order to attract jobseekers who may not be visiting nytimes.com specifically to visit Job Market. This provides you with an outstanding opportunity to woo potential jobseekers, who may be on the site to read articles, view award-winning multimedia content or use any one of our other services. By becoming the Employer of the Day, all visitors to nytimes.com become potential jobseekers for you to target. So for $10,000, you get a 20% share of voice on the homepage for a full month. For the same $10,000, you can also reach about 1 million people in the daily print edition, for ONE day, with a 10 column inch ad (based on open rate of $1,056 per column inch), which is about 1/12 of a page. With such a disparity in how the New York Times values its print advertising and how it values its online advertising, is it any wonder that it suffers from the 10% problem? 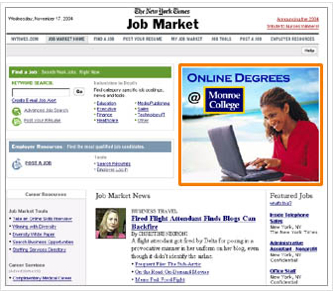 Of course, the New York Times can’t just go charging the same rates for online employment ads as it does in print. In print, no other channels reach the same high-end national audience — but online, the competition is fierce. Still, it seems impossible for the New York Times or other newspapers to overcome the 10% problem without beginning to value online ads at a premium, the same as they do in print, rather than making online look like a giveaway by comparison. Print and online are powerful, and complementary, recruitment channels; Job Market integrates both to provide an unsurpassed employment marketplace. All of our display listings now go online for 30 days at nytimes.com so that you can recruit from two top-quality audience pools. I’m sure it’s true that both audience pools are “top-quality” — it’s just that one happens to be 10 times as large — the challenge is to bring ad rates in line with that disparity in the face of fierce competition online.